Find extraordinary posts, in the ordinary ideas. My most popular blog posts have simply been me rambling about things that grind my gears. Other people think up my blog posts for me, I just am the first one to put pen to paper, so to speak, and poke fun! Take this post about things I don't understand. I practically was force fed that info from a constant slew of tweets on each subject, every single day. Simplicity makes people laugh. Yet, simple blog post ideas are over looked every single day because us bloggers sometimes think we need some grand topic to post about. 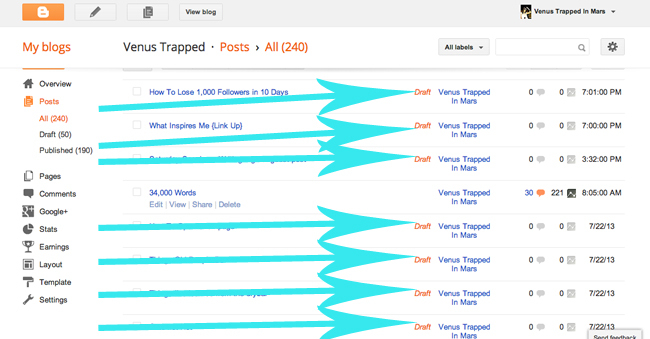 Blog post idea: All about the pressures of building a blog roll. Who should I add? What if I forget people? Will the bloggers I forget turn against me and stage a revolt? 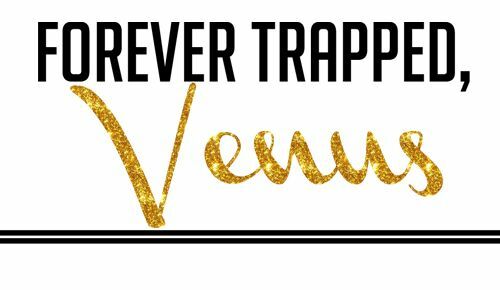 Why is it so important to have a blog roll, anyways? Are you GFC or Bloglovin? 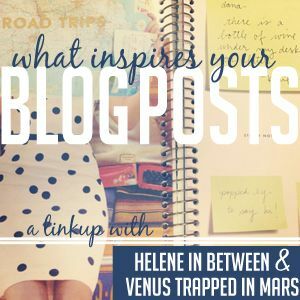 Why are the people you have added to your blog roll SO AWESOME?! Show some love to your current blog roll. etc. etc. etc. See simple tweet, lots of blog post ideas. Blog Post Idea: Commercials named after your dog. Oh wait, your dog doesn't have commercials? Oh, well how about famous dogs or people throughout time with your dog's name and why your dog is cooler. People love blog posts about dogs. By people I mean I do. Blog Post Idea: People love "How To" posts. Do you know how many people in this world have to occasionally write press releases for work? How about a post on how to write a press release. Even better, what do you do for a living? Are you really good at excel and can give everyone short cuts? What about photoshop? Or maybe you have learned tips on your gadgets none of us know. Write a "how to" post and then start pinning away. All of a sudden you have more traffic streaming in! Blog Post Idea: Do you ever have one of those posts that after you finish you want to hit publish right then and there rather than waiting until the next day when it is supposed to go live? You just know people will love it? Well I tweeted this on July 10th and it got me thinking, man... dudes have no idea how to properly identify women's clothing do they? This post was born a week later, all from one simple tweet. The easiest target to make fun of is yourself. I promise you won't hurt your own feelings. Unless you are perfect. In which case, do a blog post on all the things that make you all around perfect and give me your URL so I can watch your followers dwindle away. How to lose 1,000 followers in 10 days. Lately I have been just starting new posts as a draft, then saving to go back and edit later. Like how I covered up the post titles? I'm not giving away everything here, people! Sometimes I'll email myself, but I don't recommend that because then I never find the email again. I also write a lot of stuff down in my planner! No matter how you make yourself notes, be sure to always remember to write a good post idea down! I hope this was helpful to everyone!! 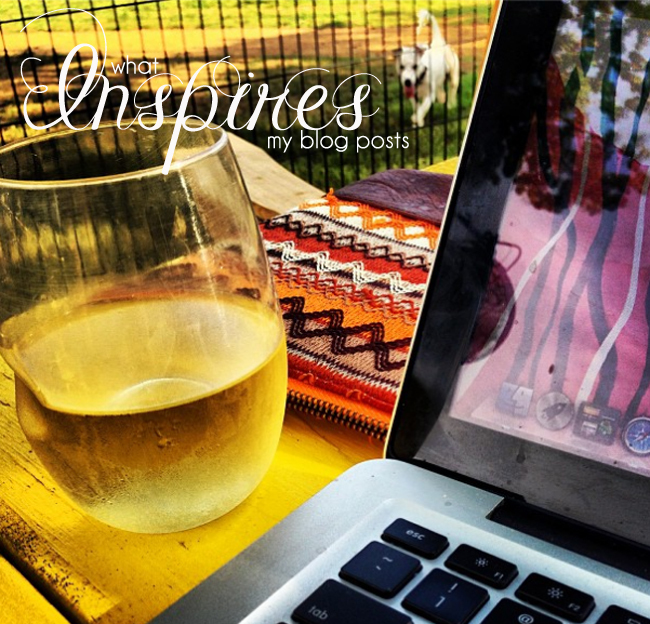 Blog about the things that inspire your blog posts. Grab a button and link back to your hosts! Taking notes all the time is SUPER important!! I have so many notes it's not even funny. And finding the simple things and making them into a post. Yes. Also your blog post is so much prettier than mine. Ugh. I'm TOTALLY borrowing (stealing) your idea on how to write a press release. Seriously, we die over some of the ridiculous releases that come into the newsroom. Love your inspirations! I also take notes, my notes app on my phone is full of them! I take notes, screen shots, and sometimes even pictures (if I'm really desperate!). Oh and the tweets is so important. I take notes too, I have a notebook specifically for brainstorming stuff. I'm having fun reading everyone's posts and finding new blogs, thanks for hosting a great link up. Awesome collection of your inspiration - I hear you on the 'write it down' theory, and sometimes when I write ideas in my planner I think 'this is what a comedian or musician must feel like'. But no, this feeling is reserved to bloggers :) Thanks for the link up! I always have 30+ posts in draft with just titles, and I have a blog section of notes in my planner too! Inspiration is everywhere, but it is ALWAYS in the little things. DAyyyum girl - full of ideas! I sadly don't have too much trouble coming up with posts, I keep a list and then just look at it and pick one I feel like. My problem is more finding time to pour the effort into actually making it a good post. Gah. I have SO MANY draft posts, from having a random idea and just creating a blank post from my phone with the title as the idea. Also, I love your tweets idea, I'll have to do that the next time I'm feeling stuck. Great post ideas, love the whole looking at tweets idea! I have a billion drafts too. It's the easiest way to keep track! hint: if you email your self have the subject line be, for example "blog post - inspirations" and then you can find it by searching blog post or the actualy content! LOVE this post. I rarely re-read my tweets so checking them for post ideas is an awesome idea. Thanks for the tips, Sarah! I have notes in my phone too! Mostly I blog about my life and random shenanigans though! TWITTER!!! I love it and it totally inspires some of my posts. People say the craziest shiz on there. I love that you took us through the train of thought from tweet to blog post. I do have some future post ideas in draft form and by that I mean a blank page with a draft title. Thanks for hosting the linkup! I have a notebook where I jot ideas down all the time. It's a ridiculously long list. I also have a draft email in GMail for when I don't have my notebook. Yet I still have days where I'm not feeling any of my ideas... Such is life. Is it bad that I'm terrified to reread my tweets? I like to pretend that they are gone in a matter of minutes. so many good ideas for ways to be inspired. I also have about eleventy bajillion drafts!! usually when I look back at them though I realize there's a reason why I kept them as a draft (they sucked!) haha! I have never thought to look through my tweets for blog inspiration - so freakin' smart! I always love your tutorials and have most of them bookmarked on my laptop for easy referral when I'm trying something new. Thanks so much for hosting this linkup, I love it! I am planning on reading each and every post of the people who've linked up. Invaluable info if you ask me. Genius link up, my friend. but no really, my blog would be quite boring if i didn't make fun of myself on it on the regs. Totally agree on taking notes. Sometimes I'll have an idea and think of some specifics and if I don't write it down, I remember the big picture but not specifics and the post never gets written. And my cat's name is Bauer after Jack Bauer and he doesn't react when I watch 24 reruns. I was hoping he would! These are awesome! I really need to start taking notes so that I can quit forgetting things. I do the whole new post thing to for my ideas!!! I downloaded the blogger app just so that I could easily save my ideas on the go and not email myself to do it later or text myself. Thanks for all the great ideas - I will try out that twitter idea when I get scared that my draft counts are dwindling too low! you are one of those bloggers whose posts frequently piss me off because I wish I had thought of them, but then I get over it because I really like you. Such an awesome link up! I'm constantly thinking that I have nothing to blog about. Thanks to all of these wonderful tips (yours and those that linked up) I really shouldn't ever think that again. High five Sarah & Helene! Hey, you really do get some great ideas! I just met a big boxer (dog) that had my name. We were at a big get together at the beach for a friend's birthday. We didn't know everyone at the party. So this guy kept yelling; "Haley!! Come here!" I was pretty confused until I figured out that the dog's name was Haley too. That was certainly a first. Definitely have to make fun of yourself! I love this! For real can't wait for "How to Lose 1,000 Followers in 10 Days." I'm sure it'll be hilar. I need to write blog notes down more often. I guess I should get a blog notebook first eh?? These tips are honestly amazing. I loved this. I'm the same as you - I write down my ideas AND make draft posts. Whatever I'm closest to - paper/pen or computer/blog, I'll do whatever is easiest. Now I don't feel like such a spaz for forgetting ideas as quickly as I get them.